The interest to obtain the CFA designation has been increasing since 2000, and India is now one of the countries producing the most number of CFA charters. ICFAI University used to offer a degree for its CFA course in India. In 1997, CFA Institute in the US filed for infringement of copyright to protect its CFA® title as a global brand. In 2012, an out of court settlement was finally reached in which the ICFAI would stop offering its CFA Degrees to new candidates and would only be awarding the degree to candidates who have already registered for this course with ICFAI. 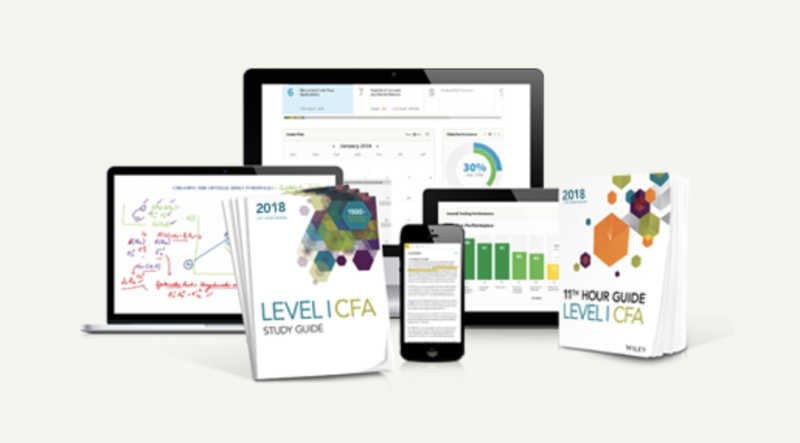 In short, if you are to enter a “CFA® Program” now, you have to do it through CFA Institute. The CFA designation is the most prestigious title in finance and investment. There are now more than 122K CFA members around the world and 92% of them are charter holders from 145 countries around the world. There is a spike in 2012 with 346 charters when the dispute with ICFA was resolved. 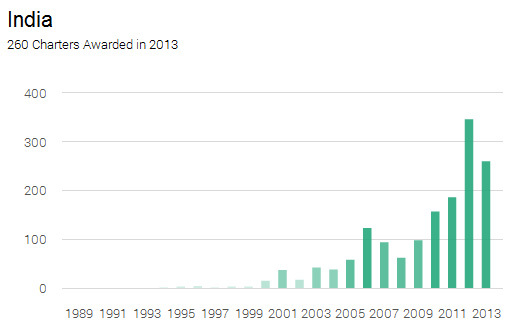 2013 was the second best year with 260 Indians successfully became CFA charterholders. 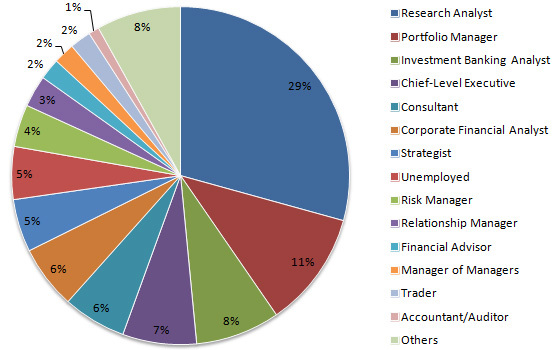 According to a CFA Institute survey in October 2013, almost 30% of CFA charter holders work as research analysts. The proportion is slightly bigger than the global percentage at 15%. 11% of CFA charterholders are Porfolio managers. Compared to the global percentage at 22%, we see there is a lot of potential in this field as India further develops its investment market and become one of the major financial centers in the future. CFA Careers in India are quite diversified. Apart from research analysts and portfolio managers, Indian CFAs work as senior management, strategists, risk managers, investment banking analysts, and to a lesser extent relationship managers in private banks, traders and accountant/auditors. CFA Institute features a successful CFA in India and his interesting story. Jayesh Gandhi, CFA, found that the CFA charter helped him stand out with recruiters both in the U.S. and in India. The way to become a CFA is no different in India than in elsewhere. To become eligible for the exam, all you need is a bachelor’s degree (3 year degree is fine) regardless of your major and area of concentration. If you don’t have a degree, you can substitute it with 4 years of experience. After joining the CFA program, you can register for the first level of the exam (known as Level I) which is held in June and December. After passing Level I, you will need to move on to Level II and Level III exams (offered once a year only in December). These exams have to be taken in sequence. 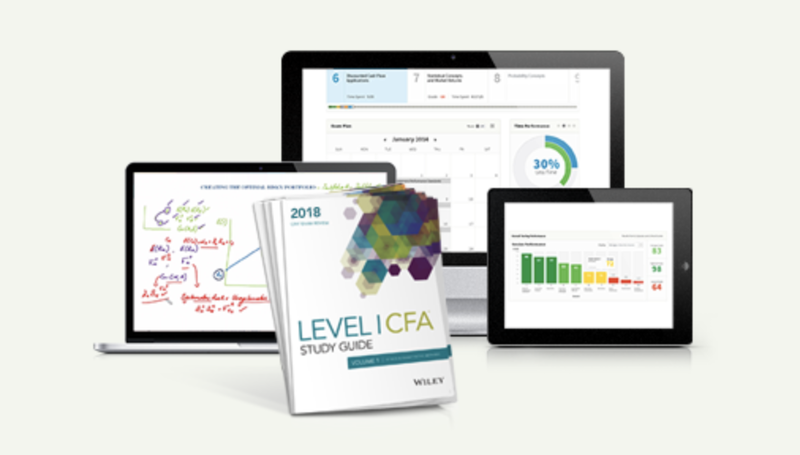 After passing the 3 levels of the CFA exam, you will need to accumulate 4 years of relevant experience on a full time basis. If you work before or during the exam, those experience can be counted as well. Once you fulfill all the requirement, fill in a form to obtain your charter. Candidates can take the June 2014 CFA exam in any of these 7 cities across India. If you are an Indian candidate residing outside of your home country, check out other CFA exam locations here. You are free to choose a testing center anywhere in the world.